A swimming pool requires regular cleaning, service and maintenance. If the pool is not maintained this may lead to a permanent deposits of grime on the pool surface. It can also result in stains all over the pool as well as growth of algae blossoms on the stone structure or the tiles of the pool. When this happens, your pool needs urgent cleaning. It is time for an acid wash. An acid wash is a drastic measure – and it is used only when your pool has not been cleaned or serviced for a long time. Being the leading provider of such a services, our licensed and qualified professionals provide acid washing services for your pool. 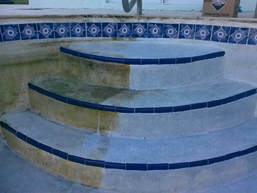 Acid washing essentially involves the use of strong chemicals that strip the old pool surface. As the old layer of plaster is stripped, all the stains, algae and grime deposits on that layer are also removed at the same time. As a result, a brand new and clean plaster layer becomes the new surface, restoring the brilliant clean looks of your pool. As mentioned above, acid washing involves the use of strong chemicals. These chemicals must be handled and used only by qualified and highly experienced professionals. If they are not handled correctly, they may cause damage instead of restoring its looks. For years, homeowners as well as businesses have trusted us with their swimming pools. This is simply because our cleaning experts are unparalleled in their expertise, professionalism and quality of service. Whenever you need an acid wash for your pool, get in touch with us. Our experts will carefully evaluate your pool’s needs and determine whether an acid wash is a good idea. They will then proceed to apply the chemicals and acids in a very controlled environment, so as not to damage the pool equipment or any other part of your property. Once the acid wash is complete, our professionals will resume normal operations, test the pool and guarantee when it is safe for use once again. Upfront price quote: We provide our customers with a price quote for acid wash upfront. This is even before you decide to hire us. We evaluate your pool’s acid wash needs and provide you a clear quote on the costs. This way, you are able to know the costs beforehand. This also ensures that things stay transparent and fair. With us, you don’t have to worry about hidden charges, last-minute expenses or any other qualms about service costs. Timely service delivery: Your time is precious and we absolutely understand that. This is why we strive to ensure a very timely delivery of our services. In most cases, we service swimming pools in Temecula the very same day. You simply get in touch us and our service experts will be at your doorstep in no time. Such timeliness is one of the key reasons why homeowners and businesses in Temecula trust us with their acid wash needs. Not only do we deliver quality service, we deliver it in a very timely way.